Our Border Collie (Sasha) has a leash fetish. She can destroy a normal leash in minutes (and has done it several times). The Aspen Pet Easy Hitch 2 Mountain Leash is one of the most amazing leashes we’ve ever used. This tough leash is made of intertwined nylon rope (approx 1’” in diameter). Sasha hasn’t been able to destroy this one, even though she tries! The handle of the leash has a clasp that opens and closes to allow your pet to be secured to a tree or railing without having to remove the leash from the collar. We love it for Flyball, as we can secure the leash around our waist while running Sasha. How easy is that?! It’s also a super strong and durable leash. 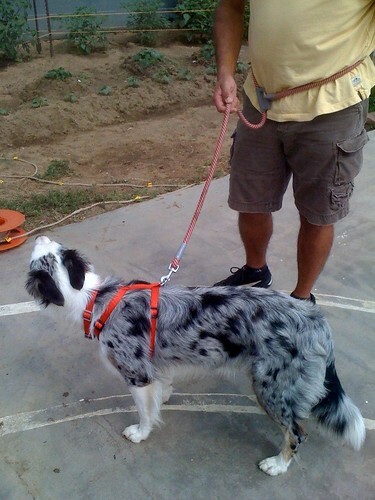 The leash is made of intertwined nylon rope and comes in red or gray. Available in 6’ length. You can purchase the leash at Petco stores and it sells for $27.99. Petco.com has it for $17.99. It’s a little pricey, but well worth it. I liked Sasha’s leash so much, that I bought one for our other vizsla, Tucker. Tuck has a tendency to pull, and having the leash around my waist seems to cut down on this, maybe because it’s easier for Tuck to gain a few inches by pulling on my arm than pulling on my waist. The Easy Hitch 2 we bought is a flat, black nylon lead. I’m sure it wouldn’t hold up to chewing as well as the rope lead Sasha has. Update: Had to bring the flat nylon Easy Hitch leash back to Petco, as there seems to be a design flaw. If Tuck pulls a certain way, he can unhook it from my waist. We exchanged it for the rope Easy Easy Hitch leash (like Sasha’s) as the clip mechanism for the waist seems to be designed much better. Yes, looks like an excellent leash for dog owners. Love that’s it is chew proof, light weight and adjustable.